The National Junior Honor Society (NJHS) is an international student organization that consists of chapters in middle schools (grades 6-9). 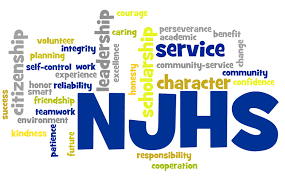 The NJHS was founded by the National Association of Secondary School Principals, and today has chapters in the United States, Puerto Rico, other U.S. Territories, and Canada. To be considered for the honor of membership applicants must reach the five standards which include leadership, citizenship, character, service, and scholarship. Applicants must have at least 5 or more hours of community service to get in. However, this is not always the case.